I guess we can never have enough of the versatility from what one can do with zucchini. Just take a look at this Vegan Pepperoni Pizza. Yes, it is topped with spicy zucchini slices, which are really tasty. 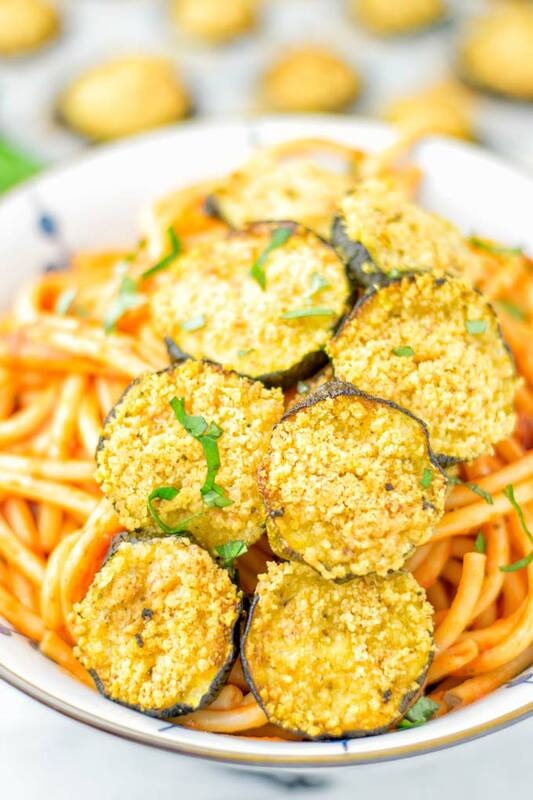 You can be sure this Baked Zucchini Parmesan is seriously the most tempting combo. It’s texture perfect, incredibly satisfying, flavor right in and out, impressive but so easy, addictive, and mouthwatering for everyone. 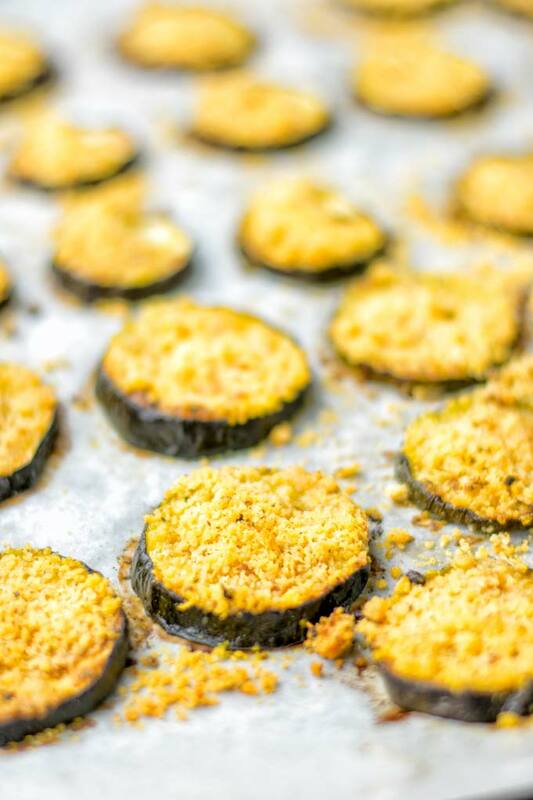 Baked zucchini (obviously). I recommend this great method if you want to prepare it with little fat and oil. All you need is a baking sheet prepared with parchment paper. 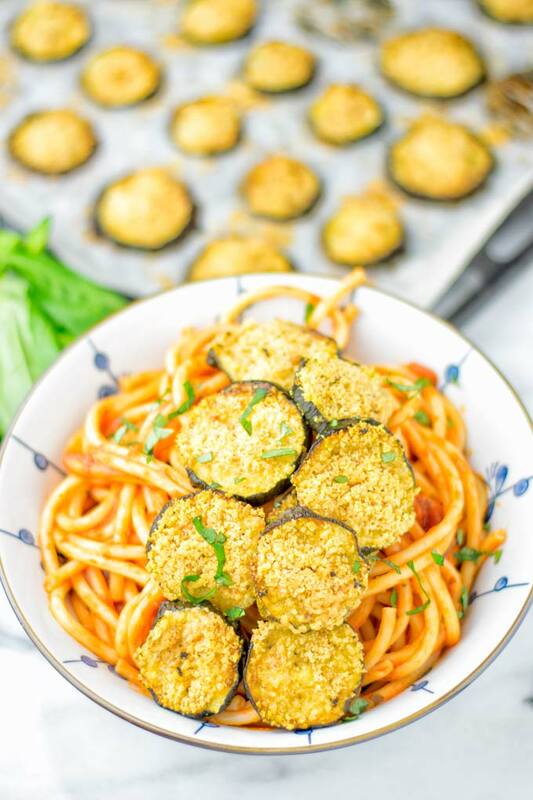 Place your zucchini Parmesan on the sheet, make sure to place them generously and not too tight. Otherwise the heat distribution will not be uniform. 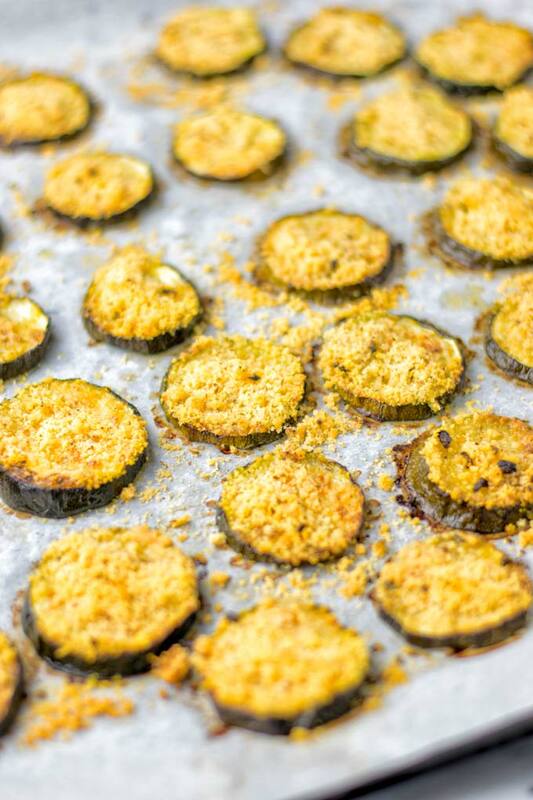 You want to make sure your zucchinis are equally baked after about 20 minutes at 410°F. Frying zucchini: for this method you can use a non stick pan. This means you can fry with a bit of oil or even a tiny amount of vegetable broth. Fry them for around 15 minutes. If you have a regular pan, I highly recommend you use oil for frying. Otherwise the slices can be burnt. It’s possible to use vegetable broth to make this recipe oil free but honestly I tried that and it’s not of my favorites. I got the taste and texture so much better by using oil. But you can absolutely do it and it will work, but please be aware the result may be vary a bit. 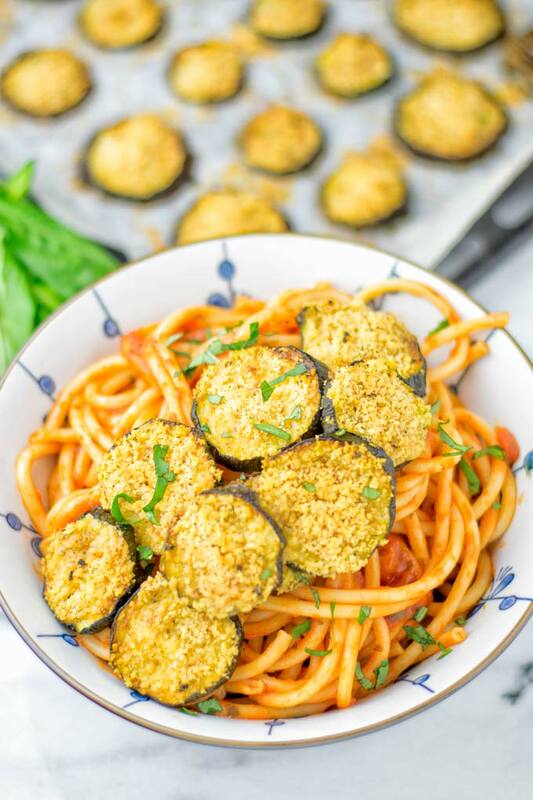 Prepare the Vegan Parmesan Cheese (3 ingredients, 1 min) by just pulsing cashews , garlic powder and nutritional yeast in a blender. Season with salt and set aside. Remember baking on a baking sheet prepared with parchment paper will take around 20 minutes. This makes such an amazing and satisfying dish for lunch, dinner, date night, even meal preparation and work lunch approved. It’s seriously so delicious and filling. There is absolutely no need for something more to serve with. So good on it’s own. An easy and fast dish that the whole family will love. 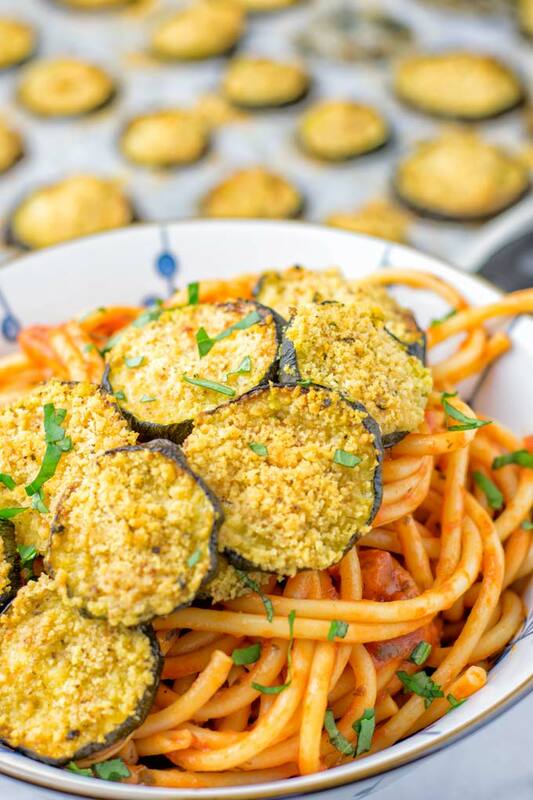 I served the Baked Zucchini Parmesan with gluten free pasta and a simple marinara sauce. Seriously the best combo, so yummy! I used a gluten free pasta which I found in the store. It was made from gf flour. No doubt it will turn out really delicious in other varieties made from chickpeas, lentils, peas, quinoa. Of course any other pasta – gluten free or not – will work. 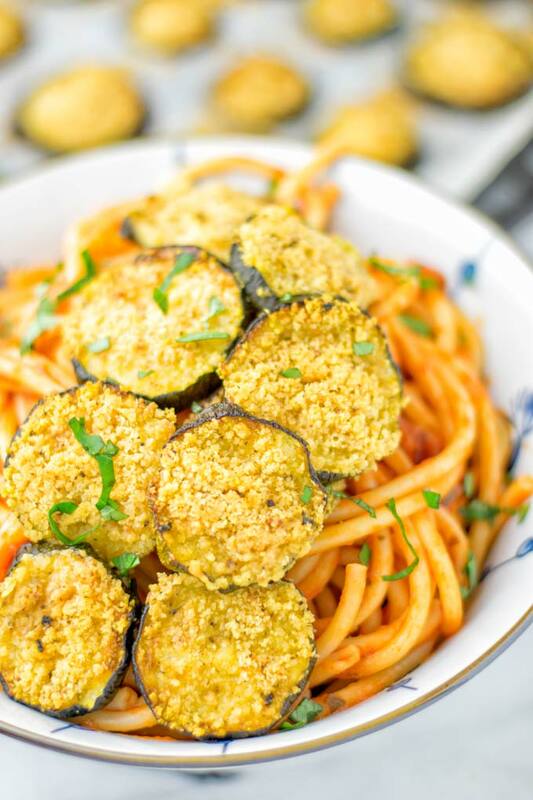 You can see I served this with pasta and marinara for me is definitely the best combo with this Parmesan crusted zucchini. I used store bought marinara to keep it really simple. It was organic so it’s not loaded with sugar and other fillers. and simply leave out the tempeh. 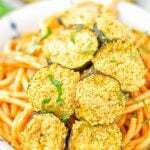 Try this Baked Zucchini Parmesan, tag me on Instagram and Facebook with a snapped picture.